Carl has been performing throughout North America and Europe as well as the Far East. One of the first companies he worked for in Europe was the Vienna Festival Ballet, touring Germany and Vienna, the to the South of France to work on a summer project there. 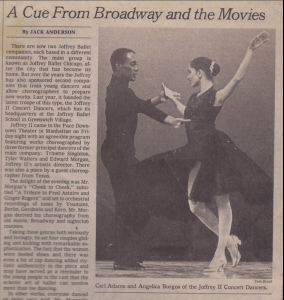 He first Performed with the Joffrey Ballet II school company then went on tour with the Joffrey Ballet Company of Chicago, where he stayed in Los Angeles to work with the Los Angeles Ballet company where they toured Twain performing A Midsummer’s Night Dream, leaving at the end of the tour to work with the Boston Theatre Ballet and Virginia Ballet Theatre respectively. In his downtime he works with Miyamoto Ballet Theatre where he was choreographer and dancer for the company and finally doing a mini tour with the Chinese National Ballet. Making his way back to UK, Carl performed with Ballet Black at the Royal Opera House then on the West End stage in the Phantom of the Opera, after which he was an extra in the hit UK soap opera Holby City and also in the new Gulliver’s Travels film, starring Jack Black. More recently he appeared as an extra in the BBC drama Luther, as well as being a guest teacher for dance schools in and around the London area, teaching musical theater classes as well as ballet coaching classes for older students.